NOTE FROM CHUCK: This week's article is inspired by a question from one of the Quilting Biz ezine readers. With her permission, I've reprinted her question and my response to her for your benefit. Sorry for the late response, but being Spring and kid's tee-ball and softball seasons, it's been a busy time here at the Smith household. Filing and Legal Fees: There will be a cost to get your business license and a cost to set up your business. Depending on how you structure your quilting business – Sole Proprietor, Partnership, Limited Liability Corporation, Corporation, etc. – you could have legal fees ranging from a couple hundred dollars to a thousand dollars. This cost will also depend on what part of the country you live in. Building or Leasehold Improvements: If you are setting up a quilt shop, you will need to have a building. Depending on whether you build a new building yourself, or lease a space for your quilt shop, you are going to have to pay for either the building or the improvements to the existing space. This can run from a few thousand dollars for leasehold improvements (shelving, paint, carpets, etc.) to tens of thousands or even hundreds of thousands if you are building a brand new structure for your quilt shop. Again, a lot of this will depend on where your new quilt shop is located. A machine quilting business can be run out of your home (if it is allowed by your local zoning board) as long as you have a room that is large enough to house the quilting machine. And you will need a good-sized room (at least 12″x18″ – so many basements are a good fit). Office Supplies and Equipment: You will want to have at least a filing cabinet, a space to do your paperwork, and some basic office supplies (paper, pencils, stapler, phone, etc.) for your quilting business. In addition, you should have a computer. All together, these can run from a few hundred dollars to almost 2 thousand dollars with a computer. Advertising: When you start any new business, you are going to want to get the word out. You should definitely make use of the power of the press to get the word out about your quilting business via press releases or stories in your local paper, but you are also going to want to advertise your new venture in the yellow pages and possibly the newspaper. But be careful – you should look long and hard at any advertising opportunity to figure out how long it will take to pay back that investment. Equipment: In a machine quilting business, you will need a long arm quilting machine. These can run anywhere from around $5,000 to over $25,000 and up. Take a look at as many models as you possibly can to narrow your choices to 2 to 4 finalists. Then, figure out a way to get some hands-on experience with each finalist quilting machine. Look for the local distributor, go to quilt shows where the manufacturers are exhibiting, or talk to your local quilt shop to see if they know someone who has that model. This way, you can make an educated decision. For a quilt shop, you will need to have some equipment for quilting classes (some basic rental sewing machines), as well as plenty of tables and electrical outlets for your quilting classes. 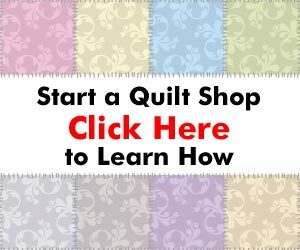 I go into a lot greater detail in these books about how to start, run, and market a machine quilting business or quilt shop, but the basics are right here. Thank you, and please feel free to send your quilting questions to me. I know in a small way how ML feels. When I started my business in 2000, I was healthy and working as a schoolbus driver. I did the quilting part time to supplement our income. In 2005 I was injured on the bus and since 2007, I’ve been home and quilting full time. Because of chronic pain I had to computerize my quilting machine or close down the business and sell the machine. I got the Intelliquilter this past September but have yet to use its full potential. I’ve also been fighting chronic depression brought on because of my condition. If ML would like, she can contact me directly. I would be more than happy to talk about whatever she needs to talk about. I know you have made a great investment in your machine, and due to your health you are unable to use it, and I know how you feel, I’ve been there having a bad back and all sitting or standing for long time is not easy. I know Eileen has talked about using the computerized machine quilting (which would once again cost money and don’t get me wrong it is an awesome idea too), but have you ever thought of actually having others use your machine, that have experience using it but are unable to buy one. Perhaps you can charge a nominal fee per hour to rent while you recuperate and gain both strength and update your knowledge.